Find out the daily salt recommendations for adults, children and babies and learn how to use nutrition labels to spot the salt in food. A diet high in salt can cause raised blood pressure, which can increase your risk of heart disease and stroke. High blood pressure often has no symptoms, and many people who have high blood pressure don't know it. For tips on how to cut down on salt, read Tips for a lower-salt diet. Adults should eat no more than 6g of salt a day (2.4g sodium) – that's around 1 teaspoon. Babies shouldn't eat much salt, because their kidneys are not fully developed to process it. Babies under 1 year old should have less than 1g of salt a day. If a baby is breastfed, they will get the right amount of minerals, including sodium and chloride, from breast milk. Formula milk contains a similar amount of minerals to breast milk. Don't add salt to your baby's milk or food and don't use stock cubes or gravy as they're often high in salt and their kidneys can't cope with it. Remember this when you're cooking for the family if you plan to give the same food to your baby. Avoid giving your baby processed foods such as ready meals as these are often high in salt. Food manufactured specifically for babies should meet the recommended levels. If in doubt, always check the label. Some food labels may only state the sodium content. Don't confuse salt and sodium figures. 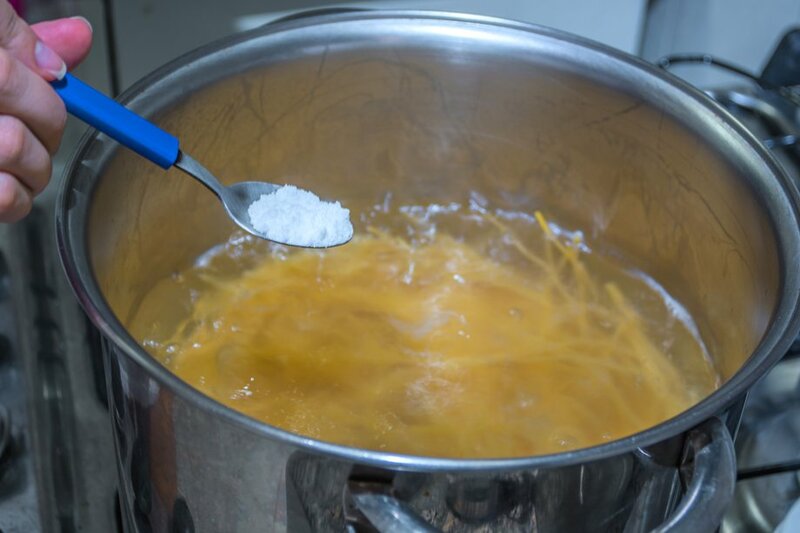 To convert sodium to salt, you need to multiply the sodium amount by 2.5. For example, 1g of sodium per 100g is 2.5 grams of salt per 100g. Look out for the salt content in the everyday foods you buy, and choose lower-salt options. Nutrition labels on food packaging now make this a lot easier. Many foods also display information about the salt content on the front of the packaging. Try to eat high-salt foods only occasionally, or in small amounts, and aim to mainly eat foods that are green or amber. Other foods, such as bread and breakfast cereals, can contribute a lot of salt to our diet. But that's not because these foods are always high in salt – it's because we eat a lot of them. In the following foods, the salt content can vary widely between different brands or varieties. That means you can cut down on salt by comparing brands and choosing the one that is lower in salt. Nutrition labels can help you do this. The Change4Life Food Scanner can help you check how much salt you or your child is having. Using your smartphone, the app can scan the barcode on food packets to find out exactly how much salt it contains. If you routinely take an effervescent (dissolvable) vitamin supplement, or take effervescent painkillers when necessary, it's worth remembering that these can contain up to 1g salt per tablet. You may therefore wish to consider changing to a non-effervescent tablet, particularly if you have been advised to watch or reduce your salt intake.